It's that time of year again: Time to make needless improvements to my website. 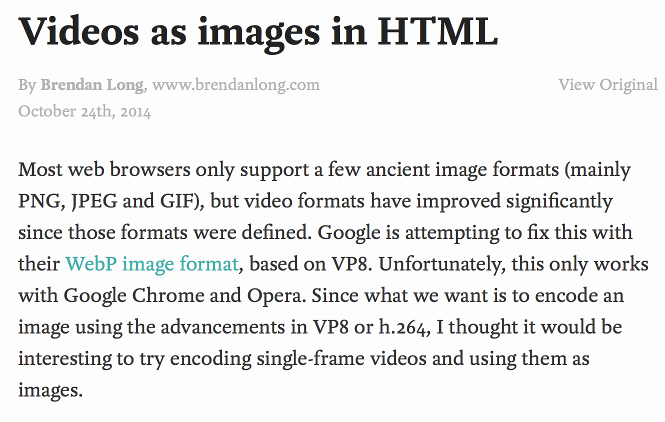 This time, I was annoyed about how my pages were showing up in Google, so I added Microdata to my articles. One thing lead to another, and I ended up with Microdata, Open Graph, a better sitemap, fewer useless pages, and much improved reading mode support. The only additions are the itemscope, itemtype, and itemprop properties. I also marked up important images to make it more likely that they would be picked up for thumbnails. The result is that bots have all of this data to look at. On Google, this ensures that it consistently picks the correct text for the snippet. I was hoping it would also use the article title instead of the page title, but it hasn't yet. Note: The crazy print-only stuff is because my site is heavily optimized to print nicely. Since my name is at the top of the site, it's silly to include it in each article, but I remove the header when printing, so having my name on the article makes sense. Try a Print Preview on this page to see! This is the same info as Microdata, but it gets picked up by Facebook, Firefox, and seemingly Pocket. 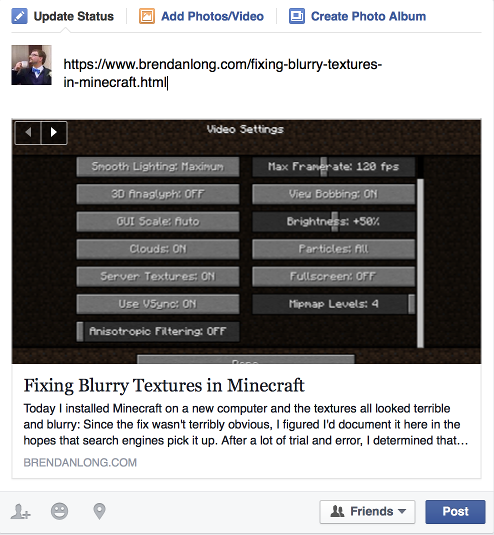 I didn't mark up images here because it would be too annoying, and Facebook seems to pick the right images anyway. Put <article> around articles. Firefox's reading mode ranks this element higher than <div> when looking for the main content. Put class="author" on the <span> with my name. Firefox assumes that this is your name. The only problem is that reading mode in Safari and Firefox looks for long pieces of content, so it just won't work on short posts no matter what. On longer posts it looks great though. Notice in particular how Pocket even picked up the publish date. 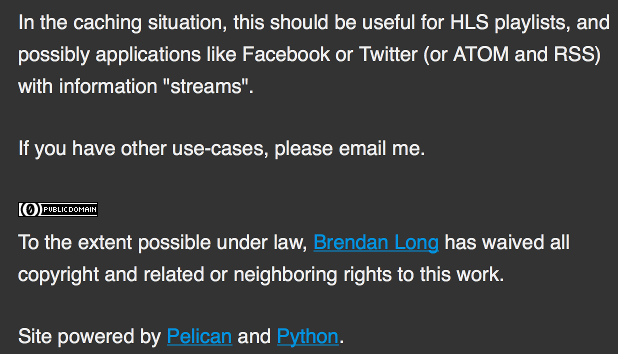 I decided to keep the archive page around, since if someone really wants to search for "site:brendanlong.com archives", then more power to them. I might even link to it in the footer one day, since a single page archive is useful for adding posts to Pocket. 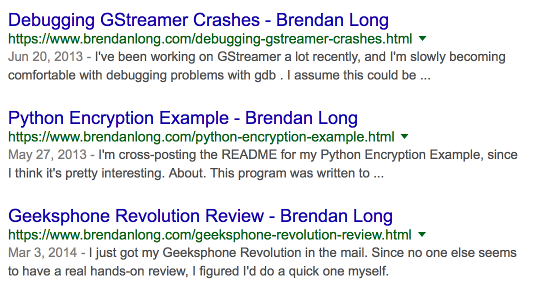 Due to how this site works, adding the meta tag on specific pages was easier than listing pages in to robots.txt.